Plan a fun weekend trip or a longer vacation to Seattle with these unique vacation packages. Inn at the Market is a tranquil retreat located in the famous Pike Place Market in Seattle. 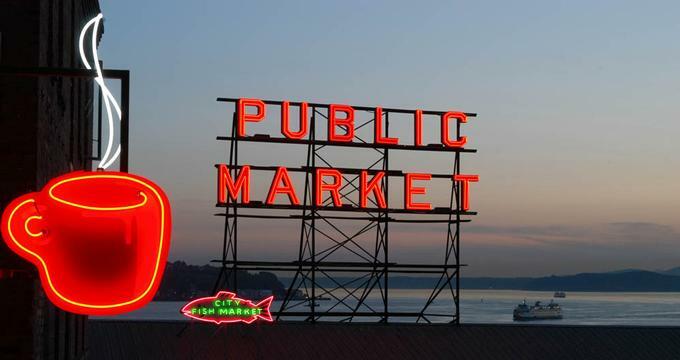 The hotel is offering the Pike Place Fish package for guests to experience the unique atmosphere at this city's market. Included in the package are overnight accommodations, parking for one car, and $100 redeemable towards the purchase and shipping of fish. Guests can enjoy a day out in the market as fishmongers throw seafood, and guests get to keep what they catch. The fish is packed and will be shipped anywhere in the US/CA. Also included is an exclusive autographed copy of the Fishmongers' book and personal photo sessions with the crew. Hotel 1000 is a modern hotel located in Seattle, Washington. The hotel features elegant rooms that have leading-edge technology to create an extraordinary holiday. VOIP phones allows guests to make domestic, international, and local calls free of charge, and the heat-detecting sensors installed in the rooms offers privacy, as staff will not disturb you. The Shop & Spa package offered by Hotel 1000 includes luxury accommodations and a 10% discount on spa retail. Guests also receive $150 spa credit once during their stay, $100 Nordstrom's gift card, and complimentary transportation to and from Nordstrom's. Grand Hyatt Seattle is a luxurious AAAA Four Diamond hotel in downtown Seattle. The Drive, Park, Stay package offered by the hotel is convenient for guests taking a road trip to the Emerald City to explore local attractions or taking the car on the ferry to neighboring islands. Included in the package is luxurious overnight accommodations and valet parking for one car per room per stay. Guests also receive access to hi-speed internet services. Standard valet parking charges apply when guests park longer than the stay period. Hotel Vintage - a Kimpton Hotel is a modern hotel that reflects the warm contemporary Washington wine country ambience. It is located near the Washington State Convention Center in Seattle, Washington. The hotel is offering the Linger Longer package for guests to enjoy a break during the holidays from Memorial Day to Christmas. This package includes overnight accommodations with savings of 30% and savings of 35% when guests stay two consecutive nights. Also included is overnight parking valued at $42. Guests receive complimentary Wi-Fi, nightly wine tastings with a concierge who is a certified sommelier, and access to a 24-hour fitness center and an award winning Italian restaurant. Hotel Ändra is an elegant boutique hotel in downtown Seattle near Pike Place Market. The hotel reflects an European atmosphere with a Scandinavian design that is modern yet timeless. The Ändra Kultur Package offered by Hotel Ändra includes 10% off the best available rate and complimentary valet parking valued at $39. Guests also receive a late check out option of 13:00. Other amenities include access to a fitness center, a lobby lounge with a fireplace, and a Greek-Mediterranean restaurant. The Urban Yoga Spa is just a block away, and it offers specials packages for guests from Hotel Ändra. The Maxwell Hotel is an elegant hotel located near several attractions in Seattle, Washington. The hotel has close ties to Seattle's arts community, and the Glassblowing package gives guests insight into the basic techniques of glassblowing. Guests receive a discount on room rates and a hands-on course on glassblowing at Seattle Glassblowing Studio. Working alongside professional glassblowers, guests can design either a glass ornament or sea float or opt to create a glass bowl or seasonal item. Also included are tickets to the new Chihuly Garden and Glass museum at Seattle Center. Other amenities include complimentary Wi-Fi, local shuttle service, an indoor pool, and a fitness center. Hyatt At Olive 8 is a luxury downtown hotel that is located near the Seattle Seahawks stadium in Seattle, Washington. The hotel features elegant rooms with chic amenities and a Pacific Northwest ambience. The hotel is offering the Bed and Breakfast for two package, which gives guests a chance to rise refreshed and indulge in a freshly prepared breakfast before exploring the city. Included in the package is breakfast for two every morning at Urbane Restaurant and the option of a late checkout at 2:00 pm. Other amenities include a 24hr StayFit TM Gym, indoor pool, spa, and a choice of restaurants. Pan Pacific Seattle is a modern hotel located in Seattle, Washington that is offering the Exceptional Meeting Offer. The package caters to intimate meeting of 15 delegates and those needing 10 guestrooms or more – the larger the group size, the more the benefits. Included in the package is complimentary use of the meeting room between 8:00-5:00 and tea breaks in the morning and afternoon, which include two assorted snacks with tea/coffee. The package also offers a buffet lunch or a set lunch, executive meeting setup with a whiteboard, markers, flipchart, bottled drinking water, and complimentary Wi-Fi. There is an upgrade of one coffee break to a themed coffee break for bookings of a minimum of two groups. Rates start from $69. Taxes apply. Palladian Hotel - a Kimpton Hotel, a modern hotel, is a hub for activists, artists, and emerging young entrepreneurs in Seattle, Washington. The hotel is offering the Chef Inspired package for guests wanting to taste authentic Northwest flavors prepared by renowned Chef Carolynn Spence. Included in the package is $30 daily food and beverage credit that can be used in Shaker + Spear or redeemed through in-room dining. Other amenities include complimentary Wi-Fi, luxury Atelier Bloem toiletries, a hosted social hour in the lobby living room every evening, and complimentary hotel bikes. The Arctic Club Seattle - a DoubleTree by Hilton Hotel is a luxurious downtown hotel located in a historic building in Seattle, Washington. The hotel features custom-designed beds, and the furniture is antique and ornate. The Go All Out package offered by the hotel allows guests to experience gay destinations, the Pride Season celebrations, and other LGBT events. Included in the package are complimentary one year digital subscription to OUT magazine, premium Wi-Fi, and a late check out of 14:00 when available. Guests can also relax over two welcome alcohol beverages. The Edgewater, A Noble House Hotel is the only waterfront hotel in Seattle, Washington. The hotel features elegant guestrooms that showcase spectacular views of Elliott Bay or the skyline of Seattle. The Romance on the Edge package offered by the hotel includes overnight accommodations in a room with a fireplace and a welcome amenity of champagne and handmade chocolate truffles, which will set the mood for an unforgettable getaway. Guests can relax over breakfast or brunch for two in the hotel's signature award winning restaurant, Six Seven. An entrée and one non-alcoholic beverage per person is served. Also included is complimentary valet parking. Seattle Marriott Waterfront is a charming hotel that offers easy access to the local attractions in Seattle, Washington. The hotel features luxurious accommodations and modern amenities. The Seattle Marriott Waterfront plus Seattle Aquarium package offered by the hotel allows guests to visit one of the most popular attractions in the city and the ninth largest aquarium in the U.S. Included in the package are overnight deluxe accommodations and complimentary breakfast for two every morning. Guests also receive two adult tickets to the aquarium and complimentary valet parking. The package is valid from Thursday to Sunday, and rates start from $259. Taxes apply. Renaissance Seattle Hotel is an elegant hotel in downtown Seattle, Washington that features luxurious AAA Four Diamond accommodations and modern amenities. Renaissance Seattle Hotel is offering the Staying Power package for guests to visit the museums, shopping destinations, Pike Place Market, Puget Sound and other attractions in the Emerald City. The longer you stay, the greater the savings. The package must include a Saturday night, and a minimum three consecutive night stay is required to receive a 30% discount at check out, while guests staying four consecutive nights will receive 40% off at check out. Rates start from $95-$189. Taxes apply. The Westin Seattle is a modern hotel that covers two circular towers in Seattle, Washington. Located near Pike Place Market and Space Needle, the hotel features contemporary rooms that showcase spectacular views of the city, mountain, or water. The Amazon.com shopping package - $50 gift card per night offered by the hotel allows guests to enjoy the city and have their purchases shipped home. The package includes a $50 Amazon.com gift card per night after check in. This offer is valid when making reservations three days in advance, and a $100 non-refundable deposit per night is required at the time of booking. Rates start from $179 per night, and taxes apply. Hotel Max is a downtown hotel in Seattle, Washington, and it is a popular meeting point for musicians and art lovers. The hotel is offering the Room with a Brew package, where guests receive overnight accommodation in a Max King, Max Two Bed, or Max Studio Suite room. Included in the package is a private kegerator filled with a choice of Pike Brewing's Kilt Lifter, Pale Ale, or Naughty Nellie. Guests also receive two keepsake 20 ounce Pike Brewing pint glasses. Other amenities include an event space, a complimentary craft beer hour, a farm-to-table restaurant, complimentary Wi-Fi, and morning coffee in the lobby. Rates start from $259 per night, and taxes apply. The Inn at El Gaucho is a historic boutique hotel from the 1950's in Seattle, Washington. Located near the Space Needle and Pike Place Market, the hotel is offering the Dinner & a Movie package. Included in the package are overnight accommodations in a Queen Junior Suite or Deluxe King Junior Suite and a $75 credit that can be redeemed at any of the two downtown restaurants for dinner. You will also receive two tickets to the Big Picture and complimentary valet parking. Other amenities include complimentary fresh cookies on arrival and wine tasting in the evening, high-speed Wi-Fi, and a selection of Kuerig coffees and teas. W Seattle is a high-rise modern hotel located in the financial district of Seattle, Washington near the spectacular Puget Sound. A world-class hotel, W Seattle features elegant rooms with modern amenities. The hotel is now offering the Fuel your Weekend package for guests to enjoy an unforgettable summer weekend break. The package includes a complimentary upgrade to a Spectacular room, one $50 pre-paid gift card to Fuel Your Passions, and complimentary high-speed internet access. Guests also receive two complimentary house made juices to detox and later two complimentary house made cocktails. Other amenities include a fitness center, a restaurant with a sushi bar, and a posh lounge. Alexis Hotel - a Kimpton Hotel is a luxurious historic hotel in downtown Seattle, Washington where the decor is chic and the ambience is modern. The hotel is offering the Couples Retreat package for guests to have an unforgettable time. Included in the package are overnight accommodations and valet services, a welcome amenity of Theo chocolates, a bottle of Vueve Clicquot, and rose petals. Guests also receive $50 in dining credit at The Bookstore Bar & Cafe. Other amenities include a hosted nightly wine hour in the lobby with original artwork in the background, a pool, a spa, a restaurant, and a fitness center. 25 Best Babymoon Ideas & Packages in the U.S.